This picture, taken 24 seconds after the first, has a ghostly orb back in the trees. First pic, 24 seconds before, no orbs. Apparently years ago my boyfriend Albert and some of his buddies went on a search for a local, hidden, but supposedly haunted spot out in the woods called Witches Circle. It's an elusive place that was the stomping (and haunting) grounds for some 100 year old witchy crews. They eventually found it. I hear it was cool. Five years later Albert and I decide to hike up a very local and familiar hill to track down Witches Circle again. After two fruitless hours of trail and wood wandering we gave up and went back to the cars. Then on a nice sunny afternoon a few months later, we ventured out. We found what seemed to be the right trails right away, but knowing that Witches Circle was risen on a plateau off the trails this didn't help too much. After some backtracking to where we had lost our luck before, we finally found a path. And to the side of this path was a bright beaming light leading to the top of a very flat plateau. 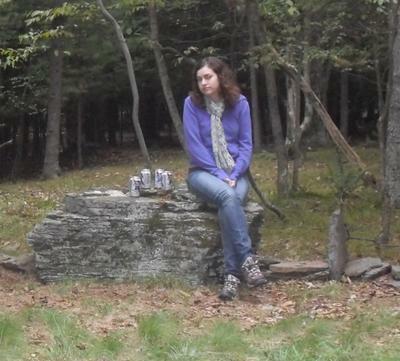 Alas, after walking up the steep hills and over the smaller rock ledges we came upon this circle of stones. There was an entrance-stone, and three other large stones sitting upright, with smaller horizontal stones between them all. On the largest flattest stone there is a little carved out spot for beheadings? blood lettings? Who knows? But definitely a creepy place. To add to the already spooky setting, trees and ferns grow all around the circle, but never inside it! So of course we needed pictures. And in an attempt to perfect the timer setting on the camera, captured a very spooky and suspicious orb in the trees back behind. According to iPhoto the first picture without the orb was taken 24 seconds before the picture with the orb. When you look closely at the tree behind the orb it is lit up through the orb. This tree is completely dark in the first picture. Spooky Scary! Its probably a mad witch. 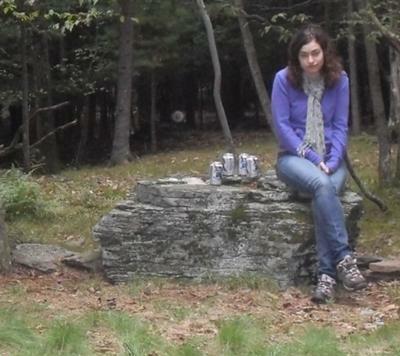 I wouldn't violate a sacred spot by sitting and drinking PBR on it. I am a camera technician with a world famous camera company. I regularly receive such images from customers , some think its an orb, but this is actually caused by light from the flash reflected by flying specs of dust. If you shoot without flash, this will not happen. And, it happens mostly in cameras with a built-in flash, not with external or on camera flash. So, orbs are not ghosts or paranormal. In the sec pic, the angle from which the photo was taken caught the younger tree covering the "orb" from the first pic. That made it totally unconvincing from my point of view. No place to wander into. Congrats on "stumbling" upon this site. This is a very sacred and powerful place. Don't get caught there at the wrong time!!! Residual Haunting , Perhaps ? An orb is a sign of a residual haunting. Unless they caught EVPs, or any action, it's a residual haunting, not an actual haunting. An amazing place, lost my soul to Lucifer. Cannot ever think Don Rickles is my ultimate comedian again!!!! If you look at it, it looks like a eye! Neat picture. I love the clarity. This is clearer than most of the other pics on here, and unmistakable! That's nothing, I actually had a physical encounter with a ghost in my house.One night I had a burning sensation on my back.So I went into my bathroom turned around and I saw 8 sets of claw marks on my back. Yes I see the difference in the forest lighting. This is a picture worth looking into and I wonder if you ever done a paranormal investigation there? If not I would! WOW! that's super creepy if I actually saw that with my eyes I would be really creeped out. WOW! When you take a closer look at the orb you can totally tell, it emits light almost!